The discussion of privacy – what it is and what it isn’t – embodies one of the preeminent concerns of the day. For this reason, privacy has been declared by Dictionary.com as the “Word of the Year” for 2013. Privacy is defined as “the state of being free from intrusion or disturbance in one’s private life and affairs.” The distinction between private and public predates the English language. In Ancient Rome, privatus and publicus were juxtaposed terms that distinguished that which belongs to the state (publicus) from that which belongs to the individual (privatus). “We, Siemens, have the technology to record it [energy consumption] every minute, second, microsecond, more or less live,” said Martin Pollock of Siemens Energy, an arm of the German engineering giant, which provides metering services. Furthermore, with all the wireless emissions associated with machine to machine communication (and the Internet of Things), the world will be overwhelmed with exponential increases in harmful radiofrequency (RF) radiation, to the point that the machines may be the only ones left in the end to inherit the earth. This entry was posted in Smart Grid, Smart Meters, and RF Emissions and tagged Big Brother, Internet of Things, Privacy, Smart Grid, Smart Meters. Bookmark the permalink. I became ill after a smart meter was installed on my house 19 March 2013 against my consent and at a time I wasn’t even aware that it had been installed as I was on my business trip interstate. While my health was slowly deteriorating, I then discovered that the Smart Meter has been installed INSIDE my bedroom wall cavity (No brickwork, only plaster between the SM and my head) I was repeatedly asking UE [United Energy] to replace the SM with my original bi-directional meter, that I paid for while I’ve installed the Solar Panels. All my pleas were ignored and ridiculed. Later I was hospitalised with an acute burning rash all over my body and swollen legs. I later complained to the Energy and Water Ombudsman Victoria (EWOV) and initially was getting the same response as from UE. Finally the Ombudsman requested from UE to either replace the meter with the original one, or switched off the pulses or remove the chip. UE refused to do anything. I had to cease professional employment due to ongoing symptoms: Burning sensation in the eyes, throat, mouth, all over the face, headaches, insomnia, acute deterioration of the vision, nausea, swollen legs, skin rashes with burning sensation, irritability, constant fatigue and short memory loss. The pain became so unbearable that I placed the last call to UE 5 Oct 2013 begging to remove the SM, but they refused again. So I took the matter into my own hands and removed Smart Meter. Once the meter was removed my health slowly started to improve, which is supported by medical evidence. After I’ve installed another electronic meter to show the good will and willingness to pay for the electricity, my health deteriorated further at a rapid speed. 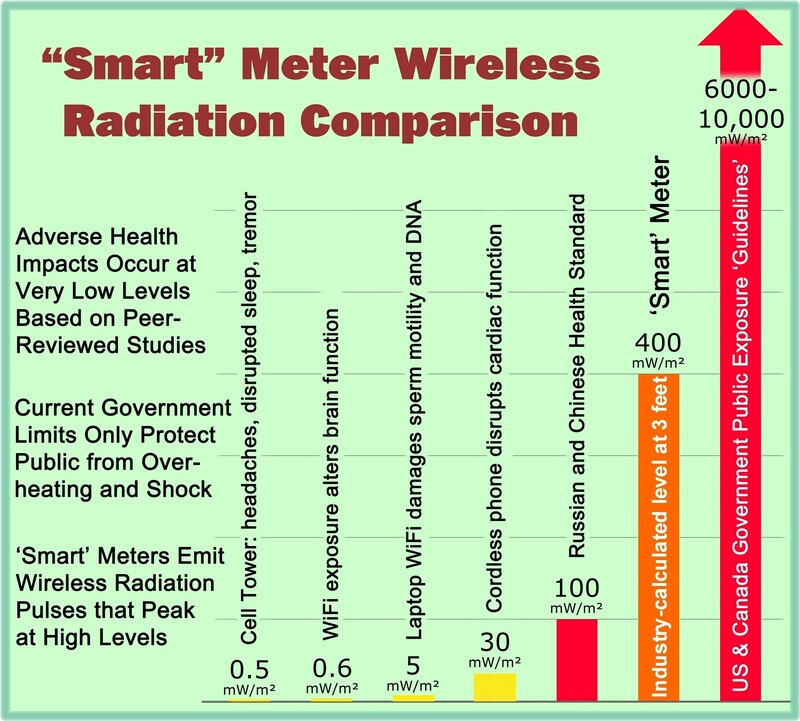 I’ve since been diagnosed with severe EHS (electro hypersensitivity), which states that my condition was triggered from the smart meter’s microwave radiation. I am now on a Disability Pension. While continuing to deteriorate health wise, I sent another letter to United Energy. This letter was based on the Minister’s (Energy and Resources) recent announcement that Victoria will have two Electrical Metering Systems, and the fact that UE has since advised their customers who refused the SM installation that they will honour their request not to have their SM installed. Therefore I requested to exchange my Smart Meter. No written reply to this request has been received to date. 3 March 8.30 AM my power was cut off and my atrocious journey to reconnect the power began. Despite a medical certificate, a disability pension, which recognises EHS and a legal letter demanding immediate reconnection and stating that the disconnection was unlawful, as no notice was given and that this breaches the disability and equal opportunity acts, United Energy continues to refuse reconnection, unless I accept a smart meter. This is at odds with recent letters to many other UE customers which “formally acknowledges their continued refusal to have a smart meter installed and honours their request to not have a smart meter installed at this time”. Isn’t this discrimination? I am single mother, with a 14 year old daughter. I contacted the UE with no outcome. I contacted the Ombudsman again. Federal MP was acting on my behalf and been advised by Ombudsman that I will get connected only after I will allow the smart meter to be installed. Legal Aid tried to assist me in my ordeal and received the same outcome. The last shock I received from the member of Minister’s office when he suggested: why can’t you move somewhere else? Why can’t you stay with you friends in the country. You don’t have to live in Melbourne… Your daughter can stay with her friends…or she can go to another school in the country. And this all is happening after Energy Minister stressed in one of the interviews that disconnecting the power from people’s houses is INHUMAINE. Me and my daughter are still living without power and suffering immensely mentally, emotionally and physically.